Belgian star Nicola Philippaerts pulled off a stunning second LGCT Grand Prix win of 2018 with a blazing victory in magical Chantilly, only hours after winning the GCL team class. Nicola (BEL) is already qualified for the GC Playoffs at Prague’s O2 area in December so second place rider Daniel Deusser (GER) now qualifies for the LGCT Super Grand Prix adding to a superstar show jumping line up. Ben Maher (GBR) lost out at the final fence of today’s high calibre jump-off in the grounds of the breathtaking Chateau de Chantilly and the famous racetrack, but he has extended his lead in the overall LGCT championship ranking and is now 38 points ahead of closest rival Edwina Tops-Alexander (AUS). Grandstands were full around the vast grass arena, the biggest on the circuit, and there was a sea of Panama hats and fans being waved in the heat of a sultry summer afternoon. Uliano Vezzani’s formidable course included three big efforts at the end of the track more suited to experienced horses and it was soon clear the double oxer combination and the Longines triple combination would take their toll on some. But the afternoon’s LGCT Grand Prix presented by Region Hauts de France delivered electrifying displays of horsemanship for the appreciative and knowledgeable crowd. Jerome Guery (BEL) sealed the first clear round on Garfield de Tiji des Templiers and was quickly followed by compatriot Jos Verlooy (BEL) who revealed he followed the advice of his Dutch GCL teammate Harrie Smolders. Harrie (NED) and Emerald were one of many combinations to suffer at the Region Hauts de France vertical and the sizeable double oxers in the middle of the arena caught out Leopold van Asten (BEL) and Marcus Ehning (GER) on Comme Il Faut. Tremendous clear rounds from Nicola Philippaerts (BEL) on H&M Chilli Willi and Daniel Deusser (GER) on Tobago Z set up a tantalising jump off and were swiftly joined by a beautifully balanced round from Christian Kukuk (GER) and the nine-year-old grey stallion Lukas. French hearts were on a rollercoaster as Kevin Staut (FRA) and Reveur de Hurtebise and Penelope Leprevost (FRA) and Vancouver de Lanlore both looked to be on the money for clear rounds but fell foul of the final fence. Then Cedric Angot (FRA) and Saxo de la Cour kept the flag flying, winning through to the jump off. But he was followed by a round to forget for compatriot Roger-Yves Most (FRA) and Sunshine du Phare who retired. Strong clear rounds from Bassem Hassan Mohammed (QAT) on Gunder and Alberto Zorzi (ITA) on Contanga showed the formidable course could be conquered in style. 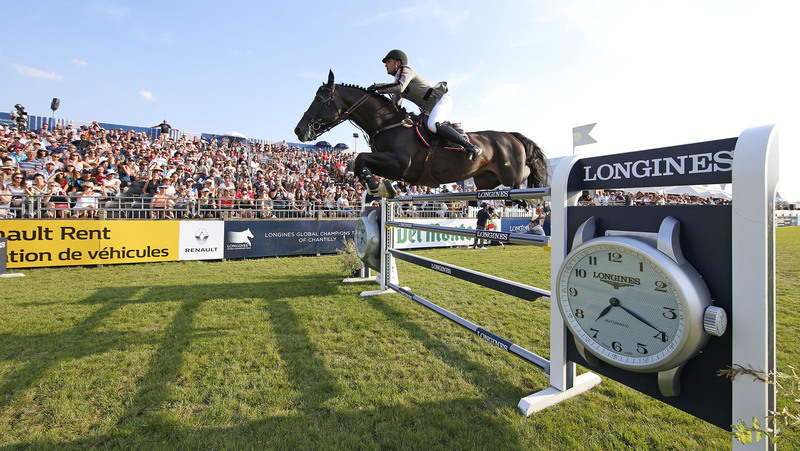 Christian Ahlmann (GER) then delivered his own masterclass on the nine-year-old grey stallion Clintrexo Z with Ben Maher (GBR) on Explosion W.
Ten went into the jump off. First to enter the arena, young talent Jos Verlooy (BEL) gave top stallion Caracas a reassuring pat as they scoped out the final round of the day. Setting off at a gallop, the pair looked strong, with a brave turn to the LGCT oxer before an uncharacteristic 8 faults at the Longines double ruled them out of a podium position. Compatriot Nicola Philippaerts (BEL) was next to go, returning to the ring with his impressive stallion H&M Chilli Willi. Powering around the arena, the dark bay horse flew over the obstacles, with the pair taking six strides to the double. A flat out gallop to the last saw the duo clear in 37.26s, laying down the gauntlet for the rest of the challengers yet to come. Germany’s Daniel Deusser (GER) looked dangerous with the small chestnut stallion Tobago Z, but despite their agile turns the pair couldn’t match Nicola’s time, stopping the clock just hundredths of a second behind in 37.30s and slipping in just behind on the leaderboard. The pressure laid down by Nicola began to show, and French hopes were dashed after Cedric Angot (FRA) and Saxo de la Cour turned too tight to the LGCT fence, taking the pole with them. Others were forced into mistakes, in an amazing run to the last in front of the packed grandstands. Jerome Guery (BEL) - delayed after losing a shoe in the warm up - collected the back of the Longines double combination, and Christian Kukuk (GER) clipped the vertical to drop him down the order. Eight faults for Bassem Hassan Mohammed (QAT) put him out of contention, before the reins would be passed to Italy’s Alberto Zorzi and Contanga who managed a careful third clear in 38.63s. Just two riders remained between Nicola’s second win of the season, and the two were world class indeed. Christian Ahlmann (GER) and Clintrexo Z took up the challenge, but the pair looked slower from the off, and an unusual refusal from the dapple grey horse would rule them out of a podium position. Final rider to go, Ben Maher (GBR), took up the charge with the nine year old Explosion, powering around the arena, the chestnut gelding responding beautifully and the pair looking up on time. They flew to the last, taking a chance with the stride and agonisingly the final fence fell, dropping them to 5th and leaving Nicola victorious. So there were jubilant scenes as the Belgian star was congratulated by riders and trainers as he celebrated his second win of the season moving up to 5th in the overall rankings. Due to this double win, he hands a place in the Longines Global Champions Tour Super Grand Prix to 2nd place man Daniel Deusser (GER), the top German rider now with a ticket to the GC Prague Playoffs this December. Gerard Manzinali, President Chantilly Jumping: "The weather was nice - a little bit hot and this year we changed a lot with the tribunes and the village. It was a beautiful show and great for the public to attend. Chantilly is a small town with 11,000 inhabitants and we are pleased to be on the Global circuit." Ben Maher, LGCT Ranking Leader: "I'm very happy with my horses - we have five events left and I have two amazing horses so I try to take them to the shows where I think they may be good. We had an expensive fault today but I'm very happy for my [GCL teammate] Nicola and my horse was incredible in the end. "I feel confident right now in the horses and I have one more result I need to count [in the overall ranking]. But there are still many good riders such as Edwina, Harrie [Smolders] and Nicola so I think it will come down to the wire. I'm looking forward to London - it's a great show and I'm very happy to back there, as last year showed great sport." Jan Tops, President and Founder LGCT: "Today was a good day - Nicola won a second time and I'm happy to see Daniel also qualified for the LGCT Super Grand Prix. He is another amazing rider and it is going to be very exciting for that class in Prauge. Ben is a very strong contender to win the championship - anything can happen, things can still change but I give my vote for Ben this year! "We have great partners on the circuit - they work the whole year behind the scenes to have the highest level of shows. Every year we keep improving - the paddock has great footing, the layout a bit different this year and it is always improving." Alberto Zorzi, 3rd place: "It is always nice to be on the podium on the Global. I am very happy with Contanga - I tried my best in the jump-off, but it wasn't quite enough." Daniel Deusser, 2nd place: "[To win a place in the Longines Global Champions Tour Super Grand Prix] is one goal for all us and to reach that goal today - to qualify for Prague - is absolutely ok for me today! The jump-off was not like I expected - I was thinking about 7 from two to three but it was very difficult and nobody did it. I took a lot of risk to the last fence and was absolutely happy with second place today. It was very close but Nicola was just a little bit faster."